I hope you didn’t miss club this month! The cards were a lot of fun. 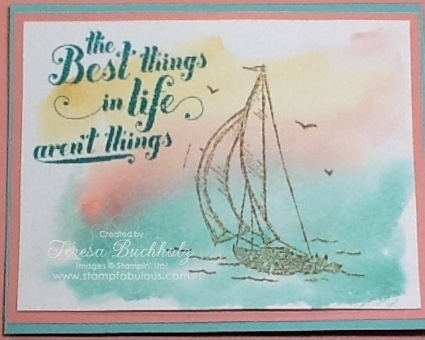 I demonstrated a water color technique that we hadn’t done before, and then we made a card using it with a retired stamp from last years retirement list. After all, this month is all about retiring stamps, so what better time to use one of my favorite oldies? Here are 2 of this months projects. Seriously, you have to see this card, the picture (and I took a lot trying to get a good pic) just does not show the fabulous colors. The last card, I put into a club members bag before I remembered to take a picture. I thought it might make her smile and she good use a smile because she wasn’t able to attend club because she was in the ER with her daughter. It was made with the new Wildflower Meadow stamp & embossing powder, Pistachio Pudding ink, and some Iridescent Ice embossing. 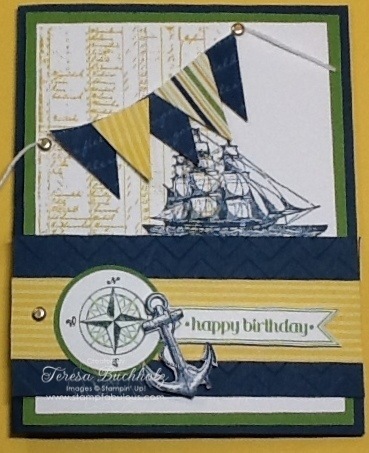 It was a lot like this card. Just maybe not so shiny. I Hope you find your hands are all inky when the day comes to and end!